SkyBlock Map is one of the best known maps for minecraft. 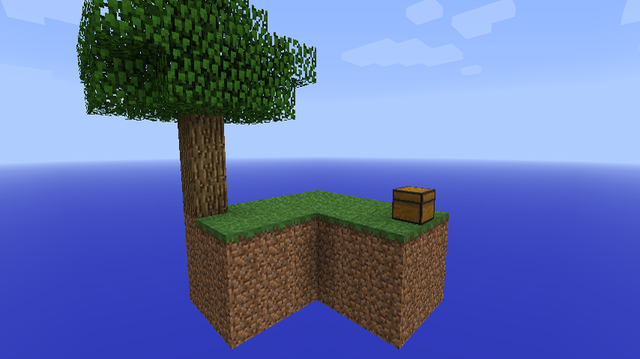 The main idea from SkyBlock Map is very simple and difficult at the same time, everything starts in a very small floating island a bottomless pit at his feet and his eyes, the goal is to survive with the resources available to you, and complete various challenges for their survival. This was the first map created in this style, there is now a hundred maps based on this famous adventure map! 10) Make 64 stone brick’s. 18) Craft 10 Jack ‘o’ lanterns. To install a map on Minecraft you simply must move the map files to the folder of your Minecraft Saves, The location of your saves folder will be something like this: “C:\Users\yourusername\AppData\Roaming\.minecraft\saves“. 2.) Type run into the search box, and select the Run program at the top of the results. 3.) Type %appdata%\.minecraft\saves into the Run program, and press Enter.